etwork. The report uses the Pavement Condition Index (PCI) to grade pavements on a scale from 0 to 100. A new road will have a PCI of 100, while a failed road will have a PCI of 25 or less and require complete reconstruction. Pavements with scores between 50 and 70 are classified as “at-risk,” meaning the roads are not in good condition but they can be repaired with thin asphalt overlays. Pavements that receive a score between 25 and 50 are in “poor” condition and cost much more to fix. In 2008 Placer County received a score of 79, which was the highest among all California counties. However, due to funding constraints we have not been able to pay for the small repairs needed to maintain our local streets and roads. Today, the region’s score has dropped by more than 10 points. This means that over the past eight years, our streets went from being in excellent condition to being at-risk and in need of repairs. And that’s not all; Auburn’s pavement score went from 70 to 65 in the past two years alone! 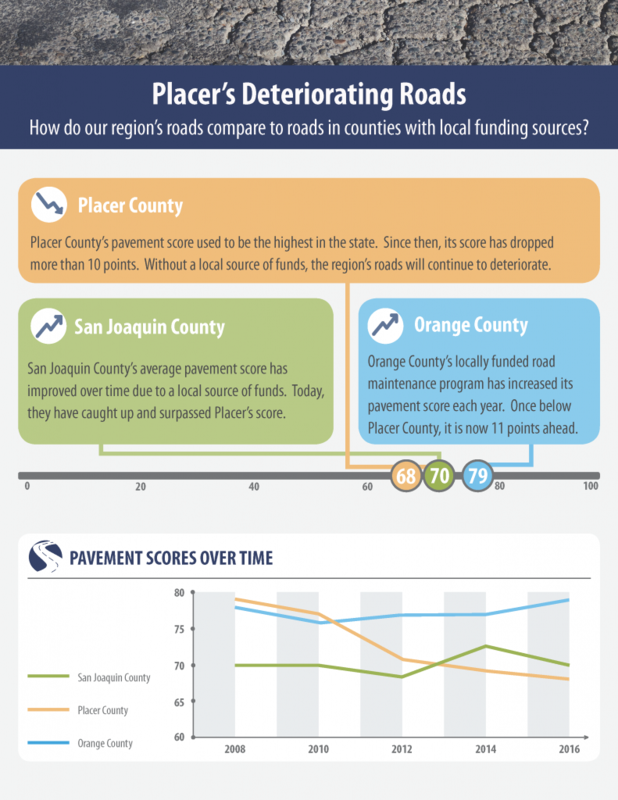 The lowest pavement score in Placer belongs to the City of Colfax, and its score of 40 indicates that the city’s roads are in such poor condition they will require much more expensive treatment. If the City of Colfax does not begin repairing its roads now, in the future they may be faced with streets that are beyond repair and require complete reconstruction. Both San Joaquin and Orange County’s roads used to be in worse condition than Placer County’s. Now, both counties have local funding sources that help them fix potholes and resurface their local streets. As a result, both counties have seen improvements in their pavement scores since 2008. San Joaquin County has caught up to and surpassed Placer’s score of 68, while Orange County’s score is now 79 – the same score Placer had eight years ago. If we do not fund road maintenance projects throughout Placer County, our region’s roads will continue to deteriorate. See how PCTPA is making road maintenance a priority for Placer’s future by visiting www.KeepPlacerMoving.com.